Strong double flow liquid line filter driers made in steel, protect the system from returning flowing with the refrigerantion changing into heating. 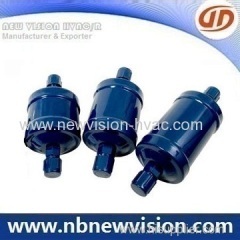 In general, a bi-direction filter dryer will be used in refrigeration cycle and heating cycle, which can replace two check valves and two common filter. 2. Max. working pressure for 3.5MPa. 3. ODF and SAE connection available. 4. The flow and filter in both direction available. 5. Filter drier installating convenietly for any position. 6. 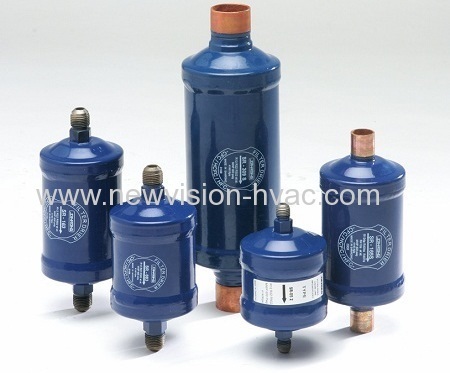 Suitable for refrigerant R12, R22, R407C, R410A & R502 etc. 7. High moisture, foreign matter, acid, oil sludge and varnish removing easily. Water Capacity in 24/52 Deg. In case of more details about refrigeration steel filter drier, it is welcome to let us know any time and the reply will be made in 24 hours.